There are so many things that need to be done – even before the writing is completed! It can be quite confusing, and time-consuming for authors do to it all themselves. And why should you if you don’t have to? As your invisible right hand we take care of the background stuff while you get on with the business of writing! Want to see some projects we’ve helped authors with? Check out our Projects page! Get the ISBN, LCCN, bar code, etc. We can however still assist with blog set up and posting and article submissions. For help with your book preparation and self-publishing, contact us. With over 15 years executive level administration experience I have exceptional organisational skills. Having worked since 2000 in the virtual world, I have access to a large network of international professionals with broad expertise and can manage a virtual team. I also have experience organising and running webinars which can be a useful avenue for promoting your book. 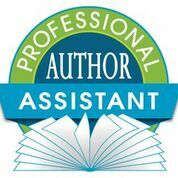 As my gift to you, please feel free to download the following information sheets/eBooks on how an author’s assistant can get you from concept to published book!